Thanks to Penny Brooks of Lyntree kennels making this the most memorable Day of my Showing Career. Critique by Judge Mrs Stella Clarke - UK. 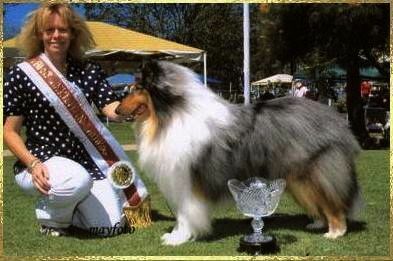 was the Rough Coated Collie, Number 63. 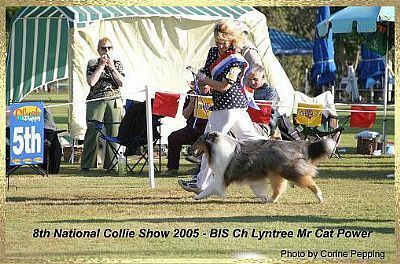 Ch Lyntree Mr Cat Power came from the Intermediate Class, sired by Ch Cathkin Thblubyu Guess Who and the Dam was NZ/Aust Ch Love to Shine at Lyntree. A very striking blue merle and although his blue could have been a touch lighter in colour he excelled in all other departments. He has a beautiful outline, masculine yet not overdone in anyway. Lovely head and desired expression, neat ears, superb neck and shoulder placement, good front, deep chest and well sprung ribs giving him plenty of heart room which is most important in this breed. He has excellent angulation throughout and strong hindquarters which are well muscled, good turn of stifle and strong hocks with well padded feet allowed him to power round the ring giving good ground coverage. Head of the desired length, clean through with the correct amount of stop, well rounded muzzle and good underjaw with tight lip line. A dog who I would be proud to own.